February 16, 2012 Dan O. When one of the satellites launched in the 1960s malfunctions, threatening the earth with disaster if it crashes, an astronaut in his sixties (Clint Eastwood) is asked to go up to fix it, as he’s the only one familiar enough with the old technology. He agrees under one condition that three of his pilot buddies from the old days (Tommy Lee Jones, Donald Sutherland, and James Garner) who were overlooked by the astronaut training program get to come along for this one last flight. Right from the beginning, this film already had problems showing with its terrible black-and-white opening prologue in which four young men all speak with these old actor’s voices, that are apparently so obvious. So as you can see, a man who is in a very peak physical condition sounds like a 70-year old who’s been dipping, chewing, and smoking his whole life. However, it got better after this. Clint Eastwood does a good job here of keeping this film moving at a slow enough pace to have us actually see all of the obstacles you have to go through for such a high-profile mission like this one, and also enough time to have us build characters to where we can actually feel something for these dudes. It’s a relatively slow film, but coming from Eastwood, I’ve seen a lot worse. Let me also not to forget about how beautiful and amazing the special effects look as well. 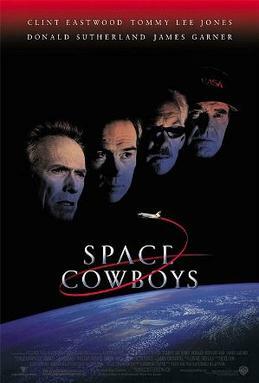 Thinking that this is an Eastwood film, who is very old at this time and doesn’t seem like the kind of guy to go for a sci-fi film with great special effects, but somehow he ends up making this film look like these guys are actually in space after all. From the stars, to the moon, to the other planets, and even to the spaceship itself, everything looks real and beautiful and makes space this piece of art that you always imagine about but barely ever see in most films. The problem with this film though is the fact that it’s script is pretty lame. Everything that happens here is all pretty cliche and you know exactly how its going to pan-out, even with the last act. Sometimes this doesn’t matter, as long as the film makes you enjoy yourself and take you away from the cliches, but here, too much of my enjoyment was centered on whether or not I could tell what was going to happen next and judging by the way this film was going, I knew exactly what was to happen. I couldn’t get into this film too much especially the last act where the whole film relies on the suspense element, even though we all know how it’s going to end anyway. I also feel like the film never knew how to play with this silly plot. The twist of the premise here is that these guys are all old cooks, which could be a lot of fun in a not-so serious way, but the film can’t decide whether or not it wants to take this path or just play the plot straight. The gags were pretty funny but none of it ever seemed like it was genuine enough for the plot, and just used as a way to show us how cooky and goofy these old dudes actually were. As for Eastwood the actor, he’s pretty good here as Frank Corvin; Tommy Lee Jones is also great at his usual miserable-like character, Hawk Hawkins (what a name); James Garner and Donald Sutherland are both very fun to watch as the other two old dudes as well. The performances aren’t bad and you can tell that they’re all having a lot of fun with these roles but Sutherland and Garner never really get that much attention when it comes to character development, which kind of bothered me. I would have liked to see all of these characters for who they are, so that when it came to a life-or-death situation, I could really root for them except just the two. Consensus: Space Cowboys has some beautiful special effects, and a cast that looks like their obviously having a whole lot of fun, but there are moments where this film sort of just falls apart due to the predictable plot, and the way the film doesn’t know how to actually approach this plot. Nice review Dan, I saw this when it first came out but have not seen it since. May have to check it out again if I see it streaming somewhere. It’s an OK flick but don’t rush to see it again. Thanks! Yeah that was pretty lame but to be honest, the whole film was a little silly as it was. Thanks Steve! I thought it was enjoyable, but it’s definitely a “fluff” film that doesn’t hold up to close scrutiny.